Cooking sustainably can mean many things: it can range from the seeds with which your food is grown all the way through the ways your waste streams are managed. Today, let’s focus on the traditional sensing of “cooking” a la Levi-Strauss. Cooking can mean building a sandwich or making a four course meal for 12– occasionally I encounter someone who says they don’t cook, and who will then elaborate on the six different kinds of soup they make. What? How is that not cooking? Anyway, I digress. Levi-Strauss was an anthropologist who thought about a great many things, about which only one we care. He created this triangle, on which he ranks different cooking methods (And genderizes them, while he’s at it. Silly man. Soup is no more femme than oranges.) and relates them to civilization. The oversimplification is that cooking with heat, especially with intervening matter like pots or water, was a greater indication of civilization. Any type of processing was considered cooking, whether it’s roasting a lamb, pounding cassava root, fermenting cabbage or fish guts, or making a salad, but heat was the true key to having proper, civilized meals was cooked by heat food. We’ll go along with that for now, although we know better. So, for that kind of civilized cooking, heat and vessels are the essential tools. Sustainability and pots are less of a concern than the heating element. Pots, by their very nature, should be very easy to reuse. You already know that disposable isn’t sustainable, right? Even the non-stick pans that you replace every few years are less than ideal. If you’re a broke student, see what you can find used. Good, study cookware should have heavy (aluminum or copper plated, typically) bottoms at a minimum but ideally they would also have the coating extending up the sides. Stainless steel is very practical, while cast iron is a little more work to maintain. Ceramic coated cast iron may be an option if you have a more generous budget. Lightweight pots and pans are generally not a great idea because they don’t heat as evenly, and you are more likely to burn things. Including the pot. Sourcing sustainable heat can depend on where you live. In some places, the sun is ideal. Plans for solar ovens abound, and they are quite functional if you have amenable weather. If you’re not so lucky, you could set up an exercise bike to run your toaster. Or set up a mini-windmill! Most of us aren’t quite that engaged in making toast, though. Wood is less than ideal, because of the particulates and limited resources in many areas, although if you heat with a wood stove, definitely take advantage of that built-in slow-cooker. Your stove and oven are also important to consider. Often, electricity is a better choice than direcly burning a fossil fuel because the electric plant is more efficient at burning and capturing energy than your local stove. Anything that helps retain heat, like a well-insulated oven, is also helpful. Smaller ovens are practical for solo cooks, and some stoves do offer two ovens these days. A larger one, for the Thanksgiving turkey, and a smaller one, for a pan of cookies or baked eggs. Most of us are limited to the resources that came with the house, or that our landlords installed. Even with those constraints, there are numerous ways to use your cooking energy more efficiently. Maximizing your cooking to heat ratio is another approach. One traditional technique was slicing meat and vegetables thinly so they would cook quickly and use less fuel (stir-fries). Another included taking pots of stew or bread dough to communal ovens. Stews could be cooked along the edges of the oven with the residual heat that escaped as the bread was being baked. Communal ovens are still found is a few areas of the world, and were once quite common in Europe and even in some part of Africa. The modern version is baking multiple items in the oven simultaneously: roast some garlic, bake extra potatoes, or make a pan of roasted squash for tomorrow as well as your originally planned main dish. Turning your oven off a little early (the last five or ten minutes) can also save a little energy if the dish will tolerate that. I wouldn’t recommend trying that with a souffle, for example, but it works just fine for an enchilada casserole. On the stove top, you can make minor adjustments to how you cook. First, always be sure your pan is larger that your fire. On an electric stove, that means the heated circle or the metal heating element is completely covered by the pot. 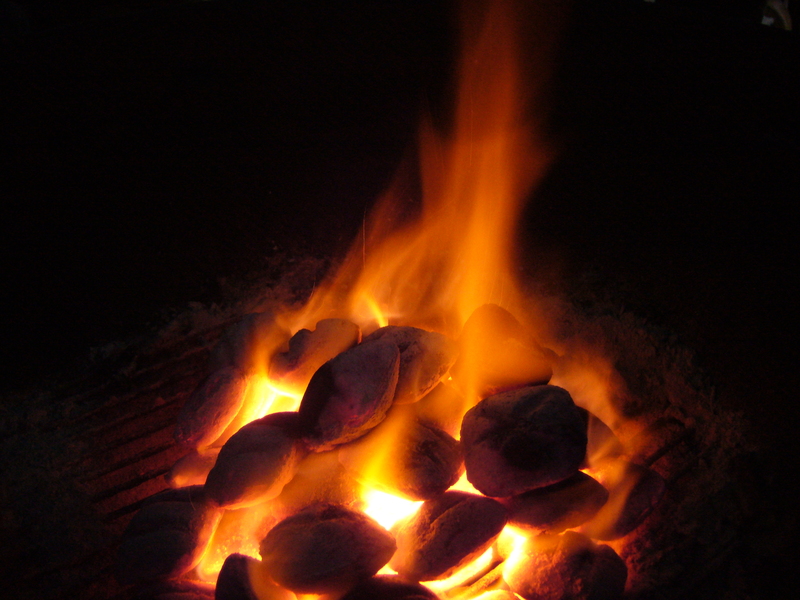 For gas stoves, that means the flame is small enough to stay completely under the pan. Choose a larger pot or a smaller burner if necessary. Also, use a lid. Again, this isn’t suitable for some dishes, but always use that lid when you are boiling water for pasta, or simmering a stew. In addition, you can work on maximizing your use of heat. Making rice? Use a large enough pot that you can steam broccoli on top. Cooking pasta? Save that hot water to wash the dishes in. You can also look for appliances that minimize your energy needs. In general, a device that directly applies heat to your food, like a rice cooker or slow cooker, will be more efficient than the stove top or oven. Stove top burners and ovens lose a lot of energy to the air while the gadgets lose less. Electric griddles, electric skillets, and water boilers (electric kettles) are other examples. Frugality in energy use is green in more than one way. While buying appliances may not save you much money, other approaches may have the added benefit of making your utility bills a tiny bit cheaper. Making small changes can produce an impact if enough people choose to do so. What have you changed about your cooking methods that works well for you? What would you like to do? P.S. Yes, fermented fish guts are a traditional snack to eat with alcoholic beverages in Japan. No, I didn’t like them. Stephanie, this was a fascinating post and really shows me how much I don’t know. I’d never heard of the Levi Strauss triangle and find it a bit odd – is he saying that boiled = rotten? (not that I boil that much). My goal in efficient cooking is to keep my home as cool as possible so that the AC doesn’t do double-time. In hot weather months, like now, breakfasts are blended. Snacks are hard cheeses and we use our outside grill. I also like cool soups but my family isn’t quite as eager.